Posted on 3, March 2016 by EuropaWire PR Editors | This entry was posted in Austria, Healthcare, Technology and tagged angio-CT concept, ECR 2016, INFINIX 4DCT, Toshiba Medical Systems Europe. Bookmark the permalink. VIENNA, 03-Mar-2016 — /EuropaWire/ — The INFINIX 4DCT from Toshiba Medical Systems Europe is making high-risk clinical cases easier, safer and faster. Interventional radiologists and other clinicians can get a close-up view of this state of the art angio-CT concept at ECR 2016 (European Congress for Radiology), March 2-6, in Vienna. Cone-beam CT is a great tool but has several limitations particularly with regard to field of view, breathing instructions, resolution, and radiation dose. In the past, when a patient underwent a high-risk intervention using conventional cone-beam CT but image quality was considered to be insufficient, he had to be transferred to a full-fledged CT scanner in another room – an interruption which could take up to an hour and left the patient vulnerable during the wait. With Toshiba’s INFINIX 4DCT a full CT scan can be done immediately using a powerful hybrid imaging system that combines the world’s most flexible angio suite with the most advanced dynamic volume CT. It gives the medical team new capabilities for planning the intervention, treatment and follow-up. INFINIX 4DCT can be configured with an angiography system and one of four Aquilion CTs: the 32-slice Aquilion Large Bore, the 160-slice Aquilion PRIME, the 640-slice Aquilion ONE and the 640-slice Aquilion ONE Vision Edition. Unique to the INFINIX 4DCT configuration with the 640-slice Aquilion ONE is the 16 cm full anatomical coverage that adds a fourth dimension to the 3D full volume scans by showing time lapse images in a cine model. 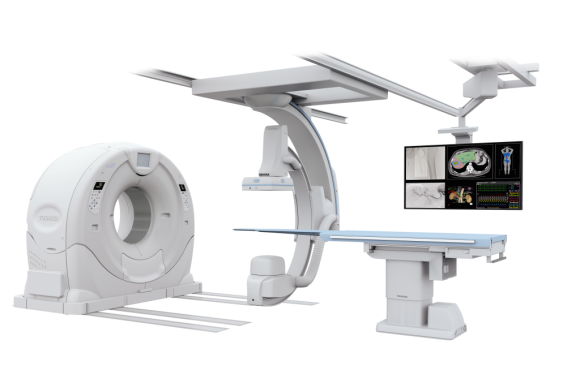 Toshiba’s signature wide detector CT technology with up to 16 cm coverage in a single rotation provides outstanding ability in a wide range of procedures including cardiac, neuro, interventional oncology and trauma. It also brings a new dimension to procedures, such as gastric-intestinal (GI) bleeding, bronchial artery embolization, complex endoleak embolization or drainage. While, for example, locating a GI bleed can be very difficult in angio view or cone-beam CT due to motion artefacts caused by breathing, a CT scanner in the room instantaneously provides high-quality images. The INFINIX 4DCT suite integrates Toshiba’s SUREGuidance for rapid, accurate target positioning be it to view a reference slice for pathology or to precisely target a position loaded from the angio image. INFINIX 4DCT also incorporates DoseRite and AIDR3D functions that optimize image quality at low-dose exposures with iterative reconstruction and Toshiba’s Adaptive Diagnostics functionalities for bone-free contrast-enhanced imaging. For more information about the INFINIX 4D CT and its uses, visit Toshiba at our booth 320 in Expo X2.